When looking for a party bus in Southgate, then it stands to reason that you would only want to use a company that clearly has your best interests at the core of what they do. That company is Rockstarz Limousine and Party Bus, and by taking advantage of our services, it means you and your guests are going to be guaranteed to have a wonderful and amazing time. 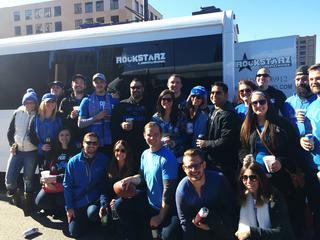 Of course, your Southgate party bus rental option should also be able to accommodate all of the guests that you would like to have with you, and that is where we really come into our own. Not only have we sought to fully equip our party bus, but we have made the maximum use of the space available allowing you to invite even more people than ever before. With our Southgate party bus service, one of the first things that you and your guests will notice when you board is that you are going to be in control of your very own nightclub. This comes complete with an amazing atmosphere that is going to take your time with us to a whole new level. From the moment you board, you will notice the stunning stereo system complete with surround sound. In addition, we have included laser light displays that just adds that extra touch to the atmosphere and there is no doubt that it will provide you with a night to remember. In the past, people have sought to use our services for a number of different reasons, from a special birthday celebration to an anniversary as well as a bachelor or bachelorette party. However, perhaps you just want to have a party with some friends and are looking for the perfect backdrop? If so, then we can help. So, if you reside in the Southgate area and are looking for a party bus, then give us a call here at Rockstarz Limousine and Party Bus. The other option is to contact us via our website, and a member of our team will be in touch to discuss your own individual needs.